As I walked through the glass revolving doors of the Hyatt Regency Houston Galleria, the main lobby floor was brimming with natural light and ambiance. 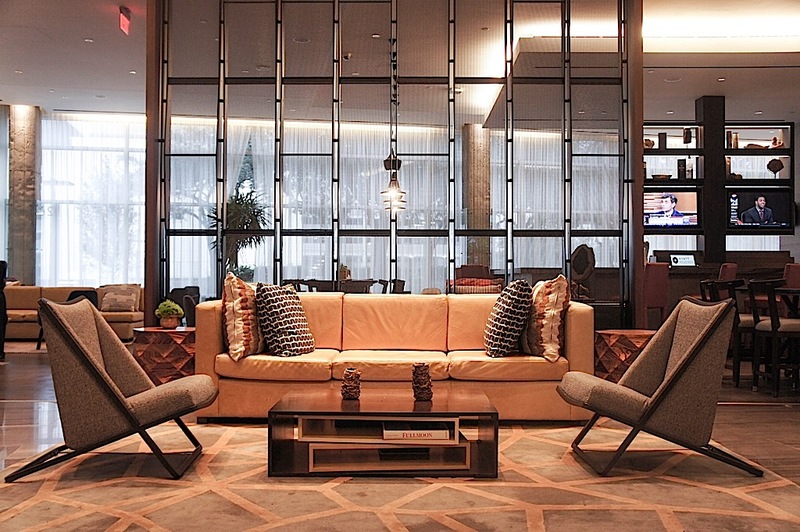 I could already sense that this hotel was different than most hotels for business travelers – more modern, more urban. Looking towards the check-in, my eyes stop to admire a large, three-dimensional metal sculpture inspired by the shape of geodes. I recall a similar metal sculpture placed at the valet, beautifully welcoming me to the Hyatt Regency Houston Galleria. Later I learn that these sculptures and artwork in the hotel follow a geological theme while paying tribute to the state’s oil industry and its workers. An expansive room with high ceilings stands to the left of the lobby check-in, separated by sheer panels, perfect for some sort of division, yet not completely blocked to enforce disconnection. 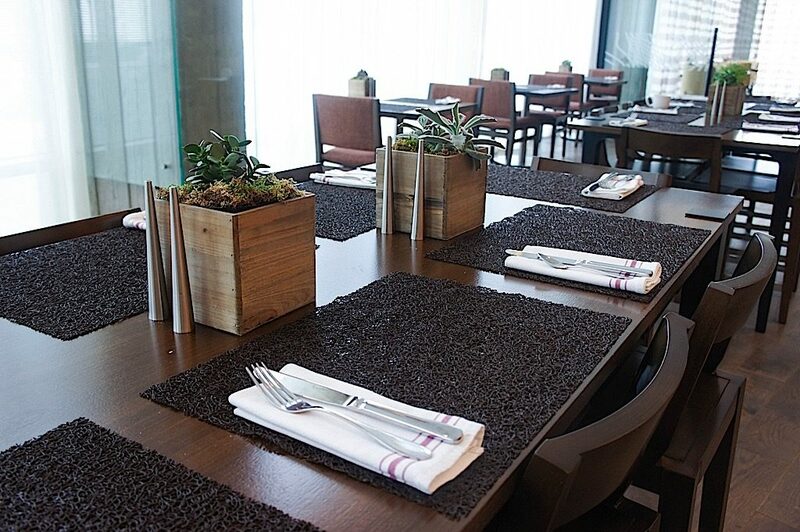 The contemporary, open area is perfect for social or business gatherings and endless conversations. 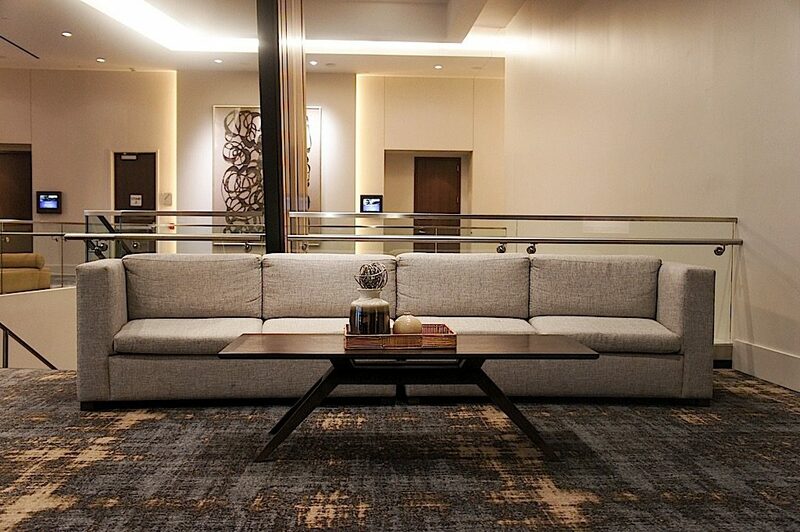 The lobby floor has clusters of plush seating that provide for discreet conversations within a shared open space. There is a center Urban Star Bar where you can enjoy a glass of fine wine or linger over crafted cocktails while catching a game on the flatscreen TVs overhead. Or if you prefer a more quiet setting, you can head to the sunlit Urban Star restaurant which serves Starbucks coffee, fresh, locally sourced food all day. Checking in was swift and easy (always a bonus especially since I checked in later in the evening). Heading towards the elevators, I couldn’t help but appreciate the grand walnut staircase with exposed steel and soaring wooden diagonal posts through the second floor. Curiosity won over as I walked up to the second floor to see what was there. The second floor houses more than 11,000 square feet of functional space for meetings, conferences, and even weddings. I fell in love with the floor’s main wall which displays numerous artwork by local Houston artists. In addition to this art wall, the halls of the second floor also display incredible one-of-a-kind pieces. I entered my Deluxe suite on the 13th floor (the Regency Club Lounge level) and was pleasantly surprised by the modern aesthetic and square footage of the suite. I am all about bright spaces and I love the floor to ceiling windows which provide lots of natural light and views of The Galleria district. 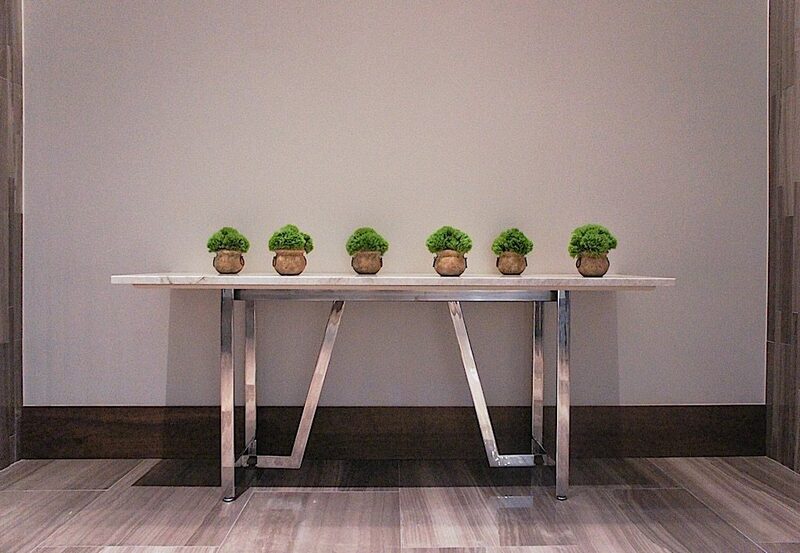 The room has two accent chairs and a marble table perfect for enjoying room service or working on your laptop. The bedroom was spacious with its king size Hyatt Grand Bed which literally provided me with 8+ hours of continuous sleep every single night. The large master bathroom features a walk-in rain shower, ample counter space and premium bath products. 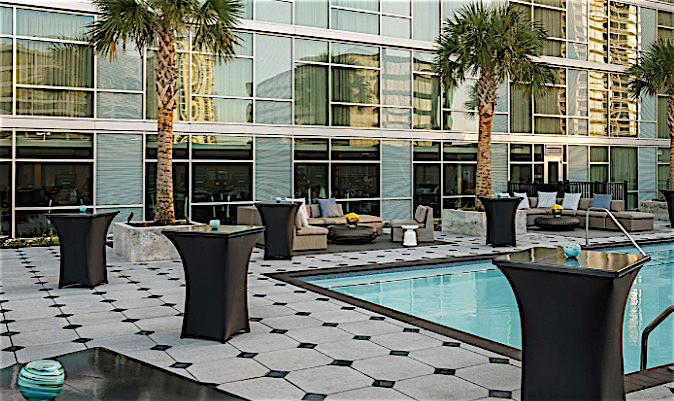 The Hyatt Regency Houston Galleria features 325 rooms, including 20 suites, as well as the Regency Club Lounge located on the 13th floor. To read more about their rooms, please click here. I was fortunate enough to have access to the Regency Club Lounge where breakfast and light hors d’ouevres are served throughout the day. The Regency Club Lounge is spacious and cozy, but also has the same modern feel as the rest of the hotel. I enjoyed fresh pastries, oatmeal, parfaits, and a variety of cereals for breakfast and would often pop in throughout the day for my fix of lattes, homemade cookies, fruits and beverages. While the Club Lounge seems unnecessary to some, I actually prefer this option if it is available as it saves me from going to a local market to stock up on water and snacks during a short stay. 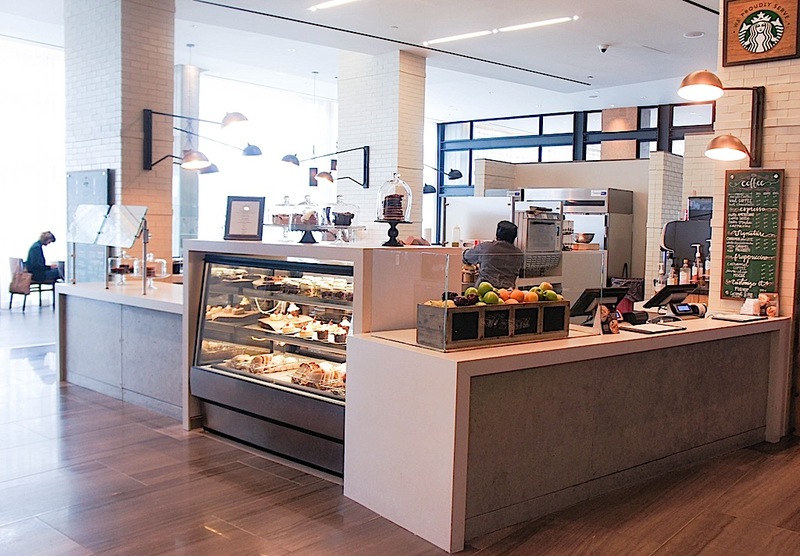 But if the Club Lounge isn’t for you, the Hyatt Regency also has the Market located on the first floor which is open all day for those who prefer to grab and go. 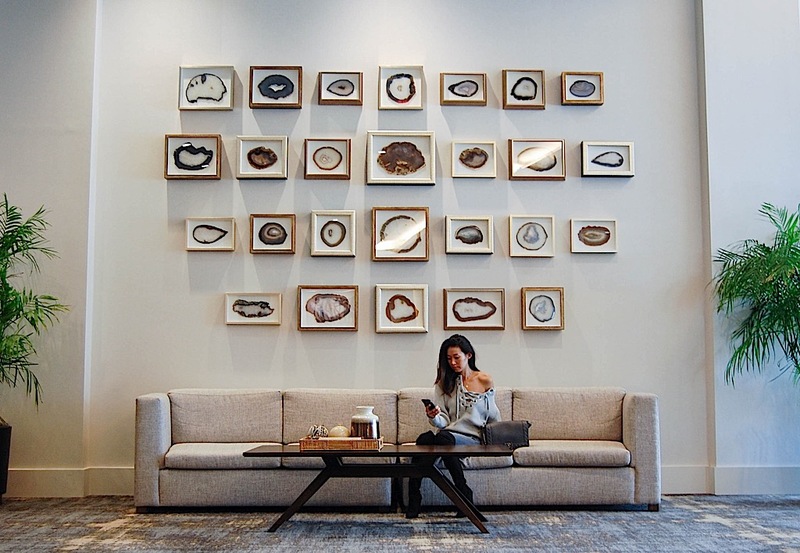 Other than all the modern interior décor and the chic vibe of this hotel, one of the best reasons to stay at the Hyatt Regency Houston Galleria is for its prime location. It is literally across the street from The Galleria, Texas’ largest shopping mall. I made three visits to The Galleria in my three day stay at this hotel (yes, it’s that close). 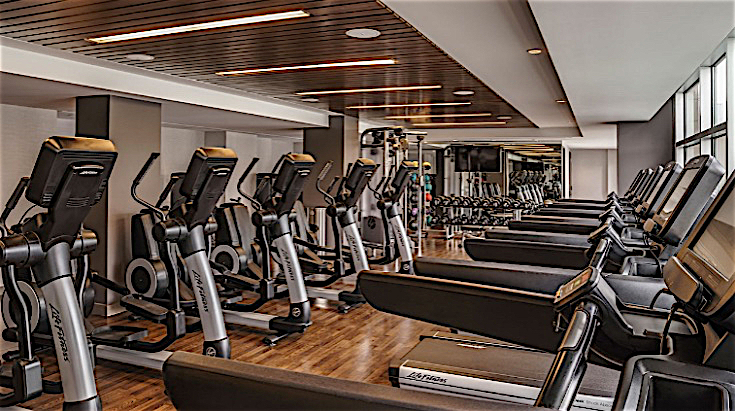 The hotel is also located nearby many local eateries and exceptional dining options that are within walking distance or a short Uber ride away. Other than my meals at the Urban Star restaurant and the Regency Club Lounge, I was able to walk to Sage 400, a Japanese sushi bar, across the street from the hotel and also experienced finer dining at Steak 48 (a must try if in Houston). I didn’t have the opportunity to use the outdoor swimming pool or the StayFit gym which has views of the pool and spacious sundeck, but I took a stroll to check it out and it is a wonderful location for lounging and relaxing or for a fun social event. I thoroughly enjoyed my long weekend stay at the Hyatt Regency Houston Galleria. 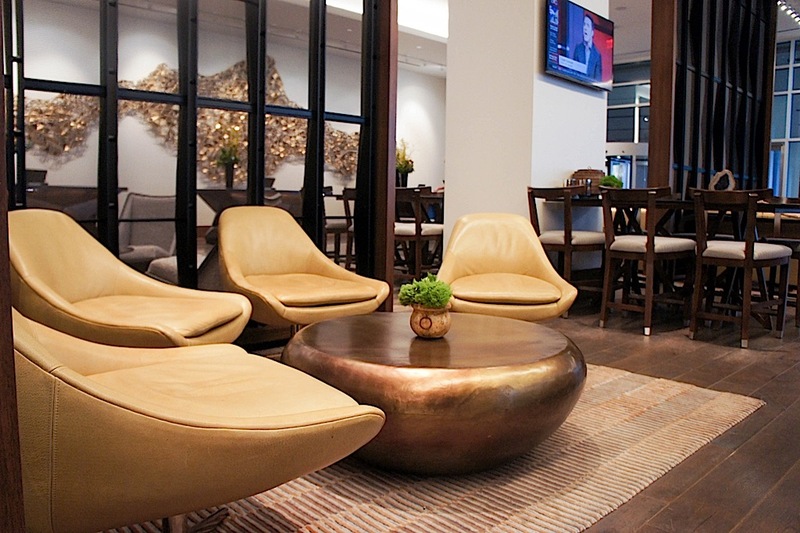 In addition to the helpful staff, modern conveniences, and amenities that every Hyatt Regency offers, the Houston Galleria property brings the best elements of the urban lifestyle together with the beauty of art, food, community, and comfort. Thank you to Hyatt Regency Houston Galleria for providing lodging, comfort, and a fantastic stay, all experiences and opinions are my own. This is such a nice place to relax! The atmosphere of it was really great. By the way, great shots! love all the photos, the angle was really good. Thank you Katrina, it definitely was an enjoyable stay indeed! Once again, your getaways are just amazing! I wish I could do this right now! All the pictures are amazing and this sounds so relaxing! Your outfits are super chic! Take me with you on your getaways! Thank you Linh, you are so sweet. It was a nice, quick getaway and the Hyatt Regency made it so much better! I totally love everything about this post babe. Love the vibe, such a great place to chill. Thanks Shaine, it really has such a great vibe and I love the natural light and open area floor plan. This hotel looks like heaven. So cozy yet chic. Absolutely love the art work from Houston locals. Looks so pretty. Love to find new places and this one is truly awesome. Thank you for sharing. Thanks Catarine. The artwork is amazing and I love that it is modern and fits with the hotel’s aesthetic. 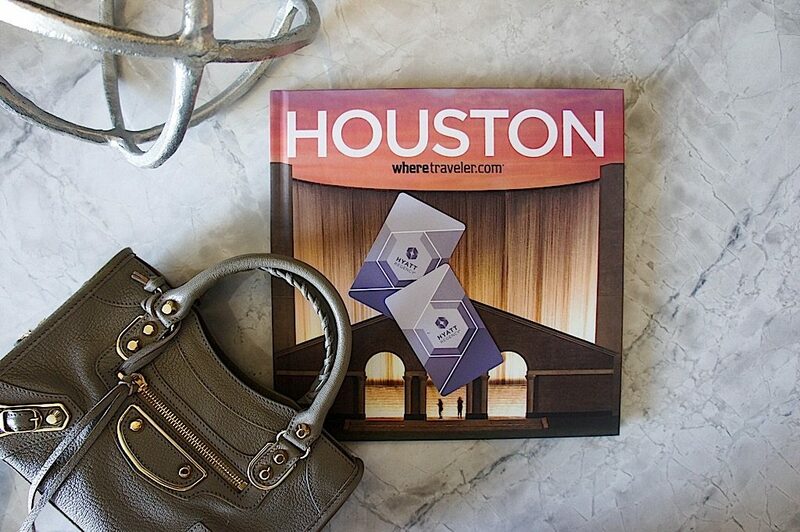 Definitely a great hotel to check out if you are in the Houston area and want to be local to all the major places in the city! Love the luxurious feel of this hotel. The room seems so huge and I like the modern decor. Also, how pretty is your lace up sweater! Hi Josie! 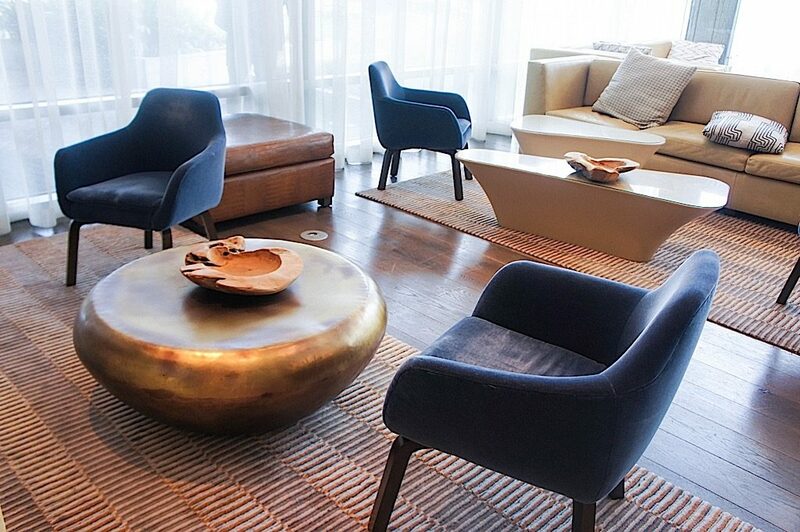 The hotel definitely has a more upscale feel, but not stuffy and more hip. The rooms are such great sizes and the open area lobby makes a huge difference too! Thank you Salome. 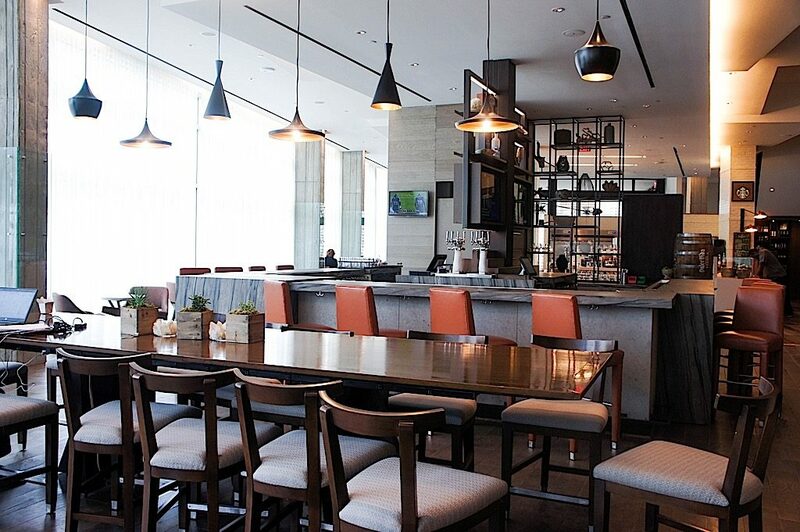 The Hyatt Regency Houston Galleria has an elements of elegance and modern touches. I totally like this cozy land elegant ambient! Thanks Isidora. It IS elegant yet cozy at the same time! wow this hotel looks amazing! you surely did a great review on it 🙂 I also loveeee your shoes so perfect babe! Thank you Fe Samaia! It was such a lovely stay and I am glad I am able to share it with you! Hi Aldora. This hotel is definitely goals and it definitely inspired me for interior decorating! You stay in the most luxurious places! I’m constantly envious of your travels, girly! Hopefully I’ll get to visit grand hotels like these one day! Thanks Stephanie! I am so lucky to have been able to stay here and glad you enjoy my travel/ hotel reviews. What a beautiful hotel!! Amazing. I’m loving all your outfits. Thanks Raysa, it truly is a beautiful hotel! Have a wonderful weekend too. I love this kind of modern and sophisticated interior. you look gorgeous too! 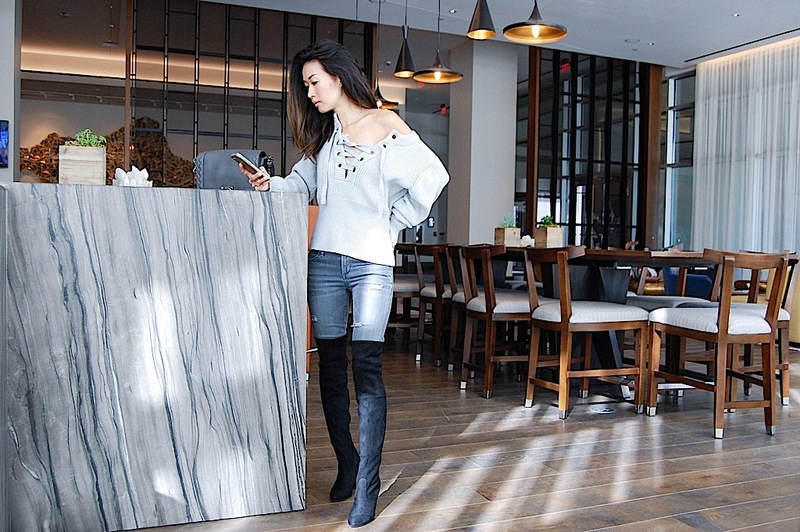 Most of the hotels I looked at before picking the Hyatt Regency Houston Galleria did not have this contemporary and urban vibe so I am incredibly happy there is a hotel like this in Houston and central to most everything you need. What a wonderful review, almost felt like I was there to experience it with you! 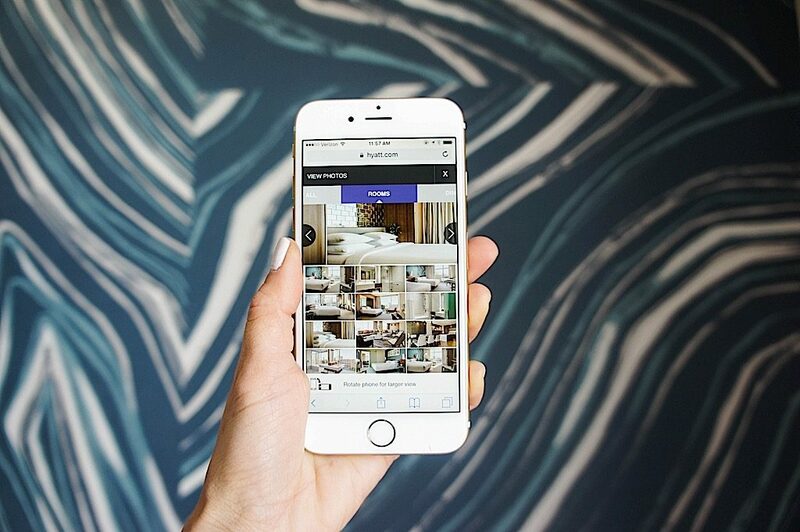 This hotel looks so contemporary and chic, with the best amenities. Love your sweater and those heels are all to die for, you look gorg as always babe. Awww thanks Kusum, I am glad I was able to provide a thorough review. It definitely is a great hotel and a must stay if you are ever in Houston! You would love it here Deddeh! I am just going to start by saying I just love your style. You always look so chic & amazing. The fur vest with the star shoes is so cool but looks like you put it together effortlessly ! And these pics of the Hyatt Houston are beautiful. They look like they should be in a magazine ! I always look forward to your blog. Thank you Gracie, you are too kind. I am glad that I was able to share the Hyatt Regency Houston with everyone and show an inside glimpse of the hotel that isn’t all on the website. I hope you have an amazing weekend! When I saw your Instagram post this morning mentioning new blog post about your last weekend’s visit, I immediately wanted to visit this post. Thank you so much for this beautifully written post about my city – Houston. I am sure you wouldn’t be surprised if I told you I pretty much visited The Galleria Mall weekly :). You found a perfect hotel to stay and those pictures are stunning. I also love all your outfits you shared here, you always have the greatest style! Hope you will plan to visit Houston soon again, we will definitely need to meet up next time as my house is like 15 minutes away from Galleria. Hi Jo! I am so sad that we didn’t get to meet up while I was in Houston, it is such an amazing city and I love the Galleria area. I will definitely be back since my sister lives there and we will have to meet up! The Hyatt is an amazing place to stay always! 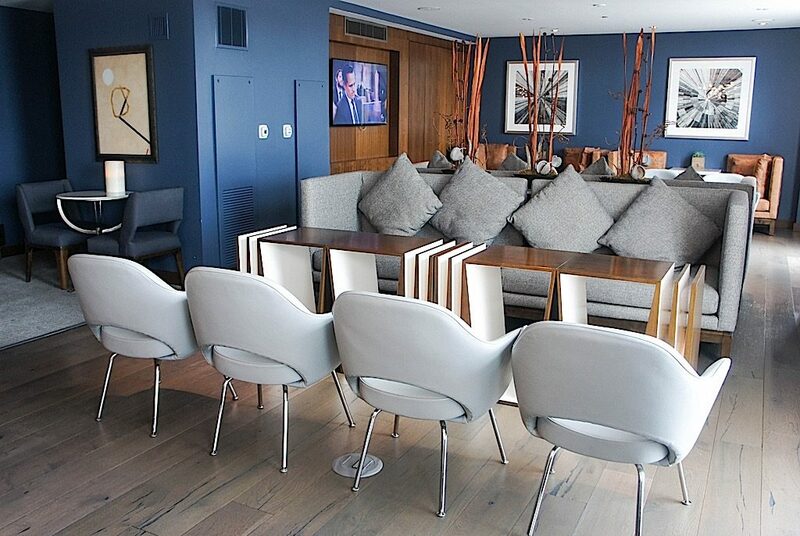 I also love their modern interior decor for how chic and classic is looks. I love seeing your cute bag through the pics too! What was the sushi bar like? Looks like you had such an amazing time! I will definitely be looking into this hotel if I ever do visit Houston 🙂 Have a great weekend hun! 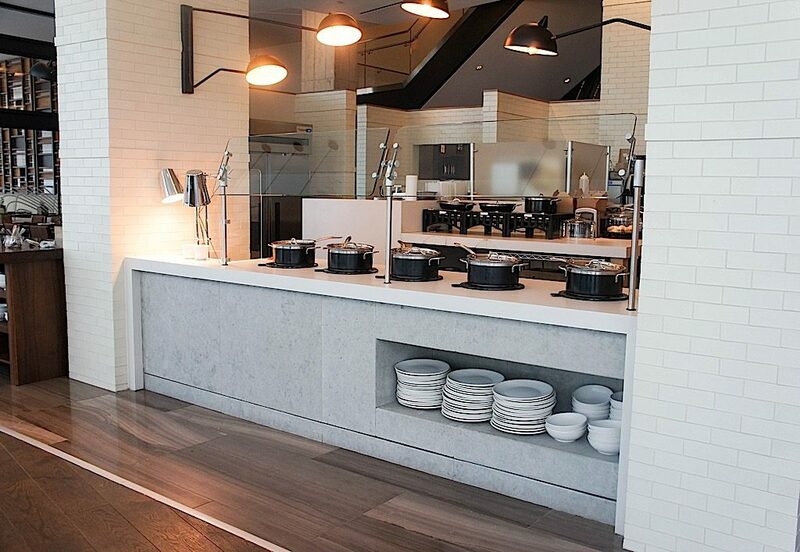 It definitely looks more modern and urban than most hotels that I’ve seen without losing professionalism. 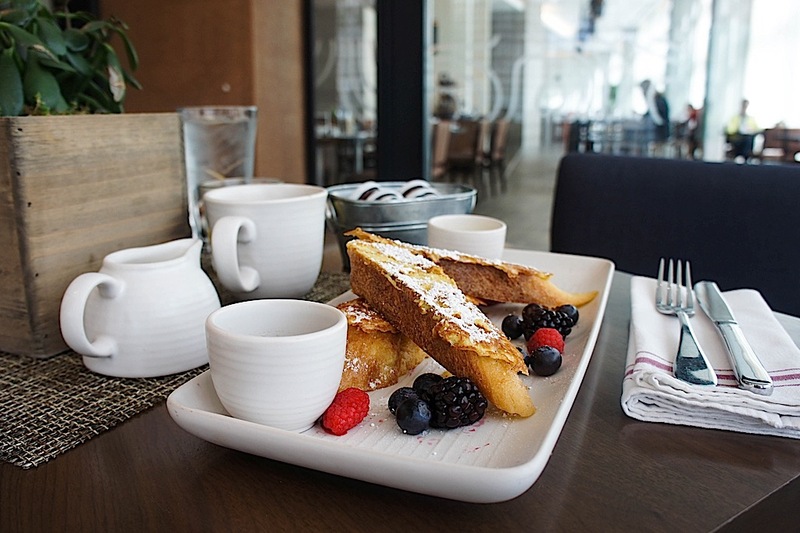 The floor to ceiling windows, delicious breakfast, and ahhhh yes the amazing room may have something to do with that! It looks so lovely and your stay sounds like so much fun!! Thank you Danielle. I was looking for a more modern hotel to stay in that was close by to the Galleria and this one really stood out. Definitely check them out if you are ever in Houston! Hi Camille. It really was a fantastic stay. Hope you are having a great weekend! This is such a beautiful hotel! Looks so luxurious and stunning! Seems like you had so much fun there! All those yummy dishes! Amazing interiors! Details! Also love all of your outfits! Hi Katya! I did have a lot of fun there and it was so convenient to be there next to great restaurants and the biggest mall! I haven’t been to the one in NYC, but I will definitely have to check it out when I am in NY next. Club level is amazing because you never have to worry about food! This was so wonderfully written again! You always take notice of all the minute details that I would have overlooked. I need to check this out when/if I ever visit Houston!! Also love that it’s walking distance to the largest mall in Texas! Always a plus for us bloggers, lol. Awww, thanks so much Jen! Yes, the location right across the street from the Galleria is a major bonus! Wow! This hotel looks amazing. I’m loving their interior, everything feels so classy. I’d love to give this hotel a visit if I’m ever in the city, it looks so amazing! Thanks so much for the recommendation babe, hope you enjoyed your stay and had an amazing time ! Thanks Lisa, I thoroughly enjoyed my stay and would stay there again. There is definitely a more younger vibe in the hotel and the lobby was always bustling but not too overcrowded and loud. Hi Charissa! Yes, I had a great weekend and enjoyed my stay. Thank you Aiko! 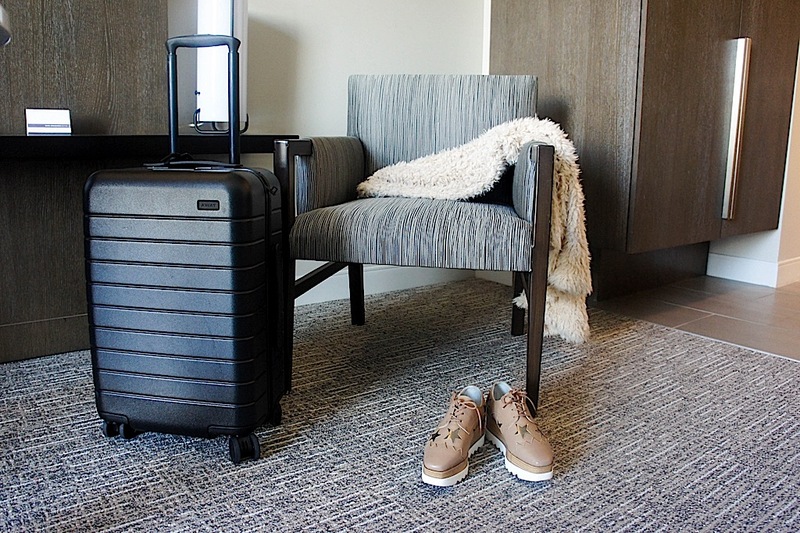 This was my first stay at a Hyatt Regency and I was highly impressed. I definitely will be staying with them more often now! Thank you Jo for your kind words. I love traveling and would love to share more hotel reviews! Thank you Ally! I hope you are having a fabulous weekend! I loved how you described everything from entering to leaving. It definitely looked like a lovely stay and so glad to hear you enjoyed! Btw, love all your outfits in this post! Thanks Alexandra, I am glad you enjoyed my review. It was such a fantastic stay and thanks for the outfit complements too! 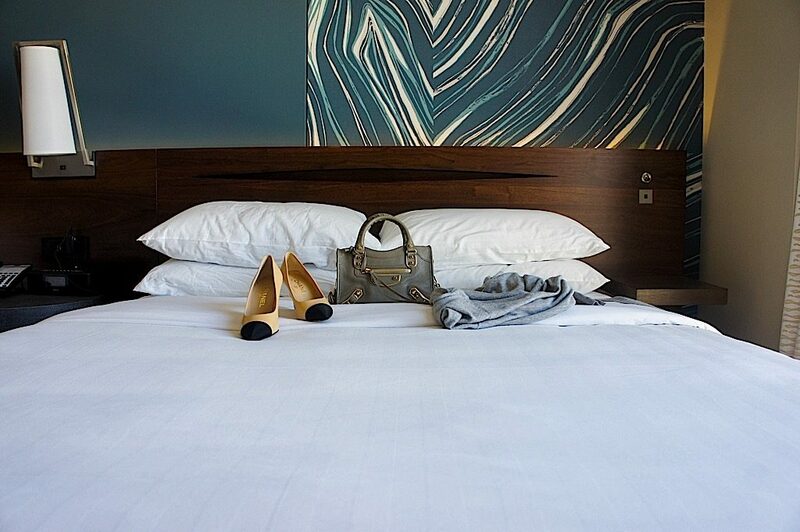 Your gorgeous photos make this hotel look so luxe. And I want all the shoes that you are wearing! Would love to stay here on my next Houston visit. This is such an elegant, considered hotel. The decor is beautiful, but still corporate. I can’t believe there is a Starbucks inside! They must be everywhere over there! Haha. I think some friends of mine live in Houston, so I may have to keep this one in mind if we ever get to go visit them. Yes, this is still a hotel for business travelers, yet the decor and even the guests that are there are also there for leisure especially since the hotel is located by popular tourist attractions. Definitely look into it if you are ever in Houston. Wow, I love the interior!!! Isn’t it so modern and chic? Yes I did Thomas. You are too cute and I agree, I love the artwork and the blend of modern yet the history of Texas. Thank you Michelle, the rooms are quite spacious and it is a perfect hotel for business, leisure, and family travelers. Looks like you had such a lovely stay! Glad you enjoyed Houston. Thank you Ravayna, I definitely did have a lovely time. Hope you are having a great weekend. What other to say than perfect! Thank you Marija, you are absolutely right, my stay was perfect! You seriously always have an aura of chicness to you kind of like Chriselle Lim does! The photos from Hyatt also look amazing and so modern! I hope you enjoyed your stay. OMG best compliment every Atsuna! xoxo! Looks like you had an amazing time! The hotel looks beautiful. I will definitely stay there if I visit Houston! It’s right across the street and you should go just even to grab some drinks! It looks like you had a wonderful time. I love the modern decor of the Hotel and the facilities look excellent. It seems like it is situated in a perfect location too (shopping wise). I will definitely consider the Hyatt when I am visiting Houston next. This hotel is so luxurious! WOW! The interiors and the extra little features are so good! Love all your pictures and the detailed review.. Hopefully one day I can visit for myself! Wow look so nice there, everything looks so fab! Wow, such a beautiful place. I love everything. The decor, arrangement.Truly a place that’s a dream. I’m loving your outfits as well. This looks like a wonderful place to stay! I especially adore the geode wall! So stunning! Thanks for all the stay tips and the tour! Every aspect of this hotel looks so elegant and dreamy! What a perfect place to stay! Not to mention, you look perfectly comfy and stylish in that lace up sweater as well 🙂 How do you like that Away bag by the way? Tech suitcases seem all the rage nowadays! Thank you Soo, it is a gorgeous hotel. 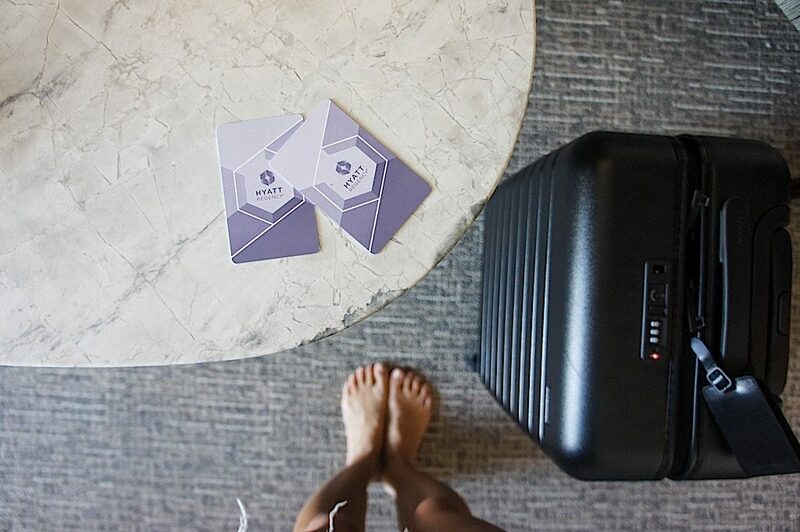 Yes, I love the Away luggage and did a blog post on the details of the luggage. It is so sleek and high tech and rolls perfectly! What an amazing place, Christine! Hope you spend a nice time there! Desperately need to plan a vacation to this beautiful hotel!! Thank you for sharing so much detailed info and such beautiful pictures my love! Looks like a lovely place to stay. The interior is really nice and the French toast looked so good. Wow Christine this looks like a beautiful place to visit. i always look forward on your hotel reviews! You take the most beautiful interior photos! Hopefully someday I can go here. That food makes me so hungry right now. and gym and pool look awesome! I love Hyatts! Always so reliable and a comfortable stay. Looks like you had a wonderful time in Houston! That place looks amazing, but you are definitely the Jackpot, honey. I love this post! The hotel looked amazing so modern yet chic!! The photos you captured looked amazing! wow babe, i love Hyatt hotels, and love the way you captured it! sounds like you had an amazing time, gorgeous photos! Thank you Melis, I definitely need to check out their hotels in NYC too! Wow this place look so amazing. I would totally go there if i’m in Houston. I travel to Texas for business quite frequently. I’m going to give this hotel a try next time I’m in Houston. Looks like such a lovely hotel. And can’t beat the Galleria right next door. Thanks for the intro. Jackie you definitely have to stay there next time! looks like such a great place to stay! thanks for sharing babe, looks like you had a fab time! This hotel looks beautiful! Your outfits are all so perfect! I am loving the off the shoulder lace up sweater in the first couple – you pull it off so well! This hotel looks amazing! Im sure you really enjoyed your stay there. wow this place looks amazing, I definitely need to go!! this hotel is splendid ! I love your outfits, the velvet blouse and the faux fur sleeveless vest. This was such a great post, Christine!! Love you, your style, and your eye for photography!! I have family in Houston so I will definitely be staying here sometime!! I’ve never been to the Hyatt, it looks like an amazing hotel! Really love your fluffy vest, it looks so cozy and perfect for Fall! Omgosh shove me in your suitcase. I’ll be your photographer. I’m not kidding. Thank you Warren! It is the perfect, modern hotel for you! Such a gorgeous hotel! I hope you had so much fun! Looked like an amazing stay and loving all your outfits girl!! I’ve never been to Houston, but if I do, this hotel looks like a winner!! That furry vest you have on is soooooooo cute! i love it!